In my last teaching experience of Knitting, I learned that not only can I teach a beginner or seasoned knitted how to read a pattern, but apparently after all my years of pattern design, I can also teach you to create your own original patterns! 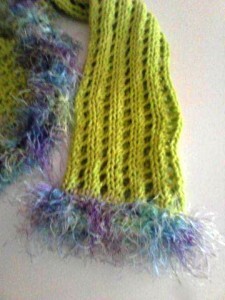 All you need is a few body measurements, chose a stitch pattern, a yarn, an appropriate needle and establish your gauge. This does not have to be a complicated design and you don’t have to know a lot of fancy stitches. A basic Knit & Purl can yield an extraordinary amount of stitch design. In the photos attached you see a simple 5X5 box stitch, a simple stockinette stitch and a variation of a Like Lace stitch. You can really choose any yarn that strikes you and you may want to try your choice of stitch and a couple of different size needles to discover the look you want, then you need to knit a 4×4″ square to determine your gauge. So cast on 32 stitches, work in pattern for 9″ then you start your increase: 48-32=16/2=8 You need to increase 8 stitches on each side to create your upper arm measurement. 5 rows = 1″ so if you increase 1 stitch at the beginning and at the end of the next 8 rows (48 stchs) work in pattern for 1 ” more ( 5 rows) and start your increase for back (60-48=12/=6) increase one stitch at the beginning of each of the next 12 rows keeping to pattern (60stchs). You should have about 12″ in width at this point Stitch marker. 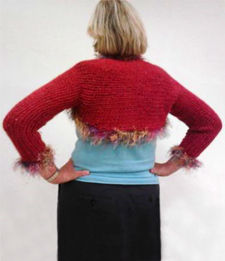 Knit in pattern for your across back measurement of 15″. Then you just follow your increase backwards to make your decrease. Use your stitch markers to act as a visual measurement comparison. Block your piece after binding off with a steam iron to even up any skew and curing edges. Using a tapestry needle sew together your sleeve portions. Try on to make sure you can get into it. Then you need to measure from behind your CB neck across your front and around the back ( outer edge of shrug) this will tell you how big your edging or collar needs to be. Lets say it’s 54, so you will need to pick up 216 stitches all around the neckline. Do this with a circular needle and work in chosen pattern to meet your design requirements for collar or trim. Bind off. This is all easier than it sounds and once you learn this principle you will find it easy to more forward and create more complicated patterns and styles. Watch for another block on how to block them out on graph paper! It should keep you in stitches!! !